I like seeing the variation of set numbers. I have started and stopped "The Monster" several times since the mid eighties and know how it feels to be getting close as well as just beginning. About a year ago I sold close to 300 and held on to only one........Lundgren PD350. Now, I'm approaching the set by teams and completing the Cubs for at least the 20th time. It's too much fun to ever be done. And, just in case you want to add another column for what you're measuring - my set attempts are always all raw. I free every card purchased from plastic imprisonment. Hey Ted? Did you miss this? Bump....I'll PM you too love to know as I know you were looking for sometime. Last edited by wonkaticket; 12-29-2011 at 04:58 AM. I finished my quest last year at 518 (minus big 4, O'hara and Demmitt). 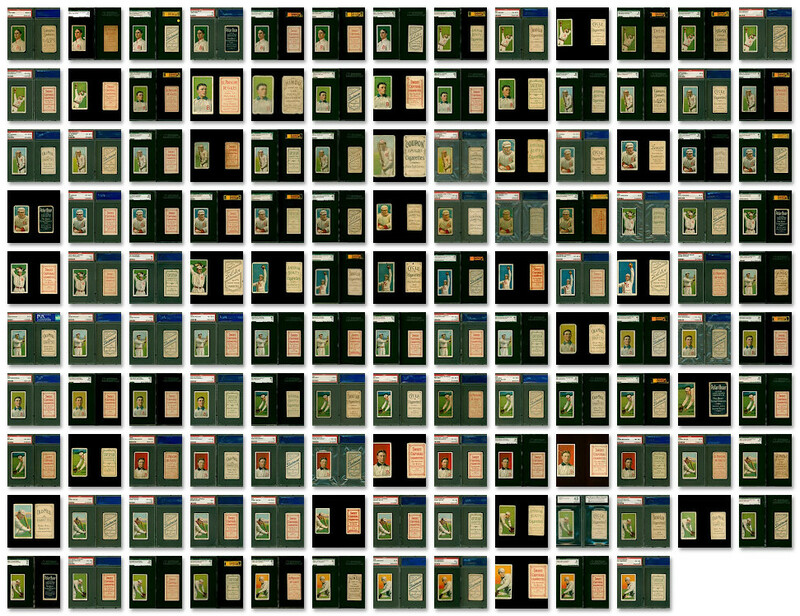 I guess I have about 300 graded from the original set and 238 ungraded. Total 538. I am about 50% complete: my score is 262. All lower-grade, mostly commons, most ungraded, no doubles. At my current pace, I'll be there in another 20 years or so. I have too many hobbies. I'm at 518 all graded ranging from SGC 10/PSA 1 to SGC 80/PSA 5. Missing big 4 Demmitt and O'Hara. 680 for me as well, thanks for doing our math Johnny Wonka brain! You kidding me I had to send it out to be done no way I'm that smart. 165 and counting for me. I bumped him two #2 when I think of Dan I think of #2. Besides age before beauty, and boy is Dan old....BTW on all these lists I keep getting stuck next to McKee like a bad family dinner. My UPDATED number is 494. I'm at 199, so it looks like that may put me in the top 30. I'll be at 201 when I receive 2 more that I purchased last week from a board member (tolstoi). So I picked up a card and dropped 5 spots. Guess I need to stop buying cards. My wife will love to hear that. 251 for me, with six of those being duplicates. I collect baseballs in their original boxes (among other baseball related things my wife HATES)! Check out my blog, but forgive me; computers and I don't dance well together! The Monster Number lives on. Glad to see the Monster number back on page 1. My number is now 489. I am currently in Thailand for three weeks, but will update my list upon my return in February. Have limited Internet access here. Thanks to John for updating the list in my absence. I haven't been able to find any T206s in Chiang Rai. Anyone know of any card shops in Bangkok, my next stop? You can get ANYTHING in Bangkok if you know where to look. I'm at 11 now, from the criteria. At one time, I had 17 cards, but had to sell all but four. I have since started to re-acquire some of those that I originally sold. All mine are raw, and being on a limited budget, I buy what I like (pose, etc. ); thus, I have very few portraits. All are in the Fair-to-Good range. I recently picked up my first Polar Bear back! Weimer, Birmingham, Murphy (horizontal), Wiltse (portrait with cap), McQuillan (I had both a Tolstoi and Piedmont at one time). One attainable goal I've set for myself is acquiring all the horizontal cards. Been collecting since 1977; started by buying cards in Fair condition for 50 cents from Richard Gelman's Card Collectors Company. How I miss it. My new number is 507. Been at it for about 3 years now. 409. Current Monster List - Any updates?? I recently hit 500, which was my goal for 2012. Recounting my T206s made me realize I need to focus more on my set than the miscuts/freak T206s. I've picked up close to a dozen T206s since my last post, yet I only added 2 to my number. I need to focus more on my set than the miscuts/freak T206s. I agree you should exclusively focus on getting that number up. Bought another card, dropped 3 more spots. I'm up quite a few... now at 210. Per the rules my Monster number is 14. Monster Number, and intriguing idea. Thanks for posting it. Would a fellow with 80 common cards swap them for a Plank? Yes. Then the Plank should count more than 80, the commons less than 1, or both. Similarly, would someone swap 240 commons far a Wagner? Oh, Yes. Then that should be adjusted, too. And aside from dollar value, the Demmitt and O'Hara cards would limit the number of 1000 sets, they should have a bit of weight, too. I figure this process is way too far along for folks to readily accept a recalibration of the process. But it is justified, don't you think? I'll be Frank, Frank. The idea was to top out at 1000, reward the big four and keep it simple enough so that 85% of the people on this board could compute their monster number accurately in less than 48 hours. Wow, you ARE Frank! The "Frank"ness of this board is astounding. But the "Frankest" Frank isn't even participating! I like the number 1,000, but you can come up with that number easily by giving some of the variations weight, without straining anyone's brains. What good is a Monster Number, if you can't Uzit? If you please, divide each of your cards by the inverse of the Pop and multiply by the square root of 2. Subtract .003483 for paper loss and multiply by 3 if your first name begins with S.
It's just the El Principe of it. Broadleaf your horizons. The post-count says it's working fine as-is - just ignore us disgruntled variation collectors. 520--since 1976. Sad thing is---then I only needed the big three. Doyle's been added since. Can you factor that into my monster number please . Would you like a copy of my Neil Diamond CD "Sweet Caporal"? Just trying to keep the post-count higher than the NYC Dinner Thread. Right you are, Craig. Brother Maynard announced the chapter and verse, but he was not the lector. As best as I can tell, it was "Brother Maynard's Brother" that did the reading, Michael Palin, as you said. Thanks!!! Excellent Frank! I've always wondered how the reader should be referred as. "Brother Maynard's Brother" does seem appropriate, in a Python-esque sort of way. "1000 shalt be the Monster Number, and the Monster Number shalt be 1000, no more, no less. 1001 shalt not be the Monster Number, neither shalt the Monster Number be 999. 1002 is right out." For back specific Monster Numbers I can break up the above into a Polar Bear set of 250 (Complete), a Piedmont 150 set of 233 (counting Magie, but lacking Wagner & Plank), a partial P350 set of 321, a partial SC350F30 set of 172, etc. Now if you'll excuse me, I'm feeling a bit peckish so I'm off to feast upon lambs and sloths and carp and anchovies and orangutans and breakfast cereals and fruit bats and ... perhaps I might just have some spam spam spam cheese and spam. are an arse of a different color. Your first two monster numbers have been duly recorded, Brother Craig. Holy Hand Grenade, Batman, what's that? I'm not sure, Robin, but it appears to be a "Full Monty". Last edited by frankbmd; 05-05-2016 at 09:58 AM. Friendly bump for Frank. With my basic (514) set complete - my number now stands at 512 (plus 2 important reprints). Very low grade, but a number anyway. Happy collecting all. New number is now 574.